A seamless exterior assures economical operation even in the most intense heat. Tested above 175°F, Polar King's fiberglass design is the perfect fit for warm weather climates. The inherent strength of fiberglass allows a Polar King unit to withstand blowing debris and abuse associated with heavy thunderstorms. Saltwater can be a real challenge for operations near the coast, especially when dealing with a metal walk-in. Because fiberglass does not rust, dent or corrode, this problem is eliminated. Even heavy snow is no match for a Polar King. The roof can be rated to withstand a snow load of up to 100 lbs. per sq./ft. Because of Polar King's construction, there is no need for steel framing. Polar King walk-in refrigeration units are designed and engineered specifically for outdoor use. Every unit is built to withstand the elements and to maintain its efficiency as outdoor conditions change. With thousands of units being used across the country and around the world, Polar King units offer worry-free operation under the worst conditions. From the intense sun of Arizona to the bitter cold of Minnesota; no climate is stronger than a Polar King. Polar King's 100% seamless fiberglass design provides a continuous surface which keeps the insulated structure completely intact; free of moisture damage and bacteria formation. Plus, all of the interior corners are rounded to further ensure a sanitary environment. The NSF approved flooring system provides a non-slip durable finish; which greatly reduces the risk of slips and falls. With the unit being completely seamless, it can easily be cleaned with a hose; without damaging the insulation. 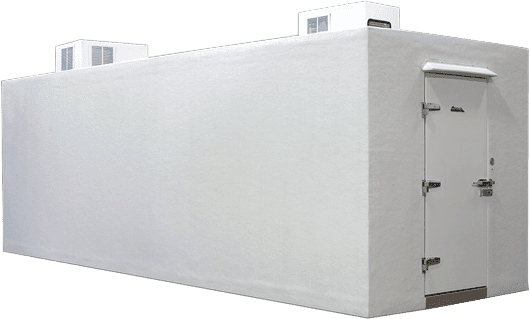 Comparing walk-in refrigeration units can be a tedious exercise, as most walk-ins on the market are very similar and are constructed of insulated foam panels sandwiched between two pieces of metal. However, when compared to Polar King’s patented fiberglass construction, the comparative difference has been very clear for over 25 years. 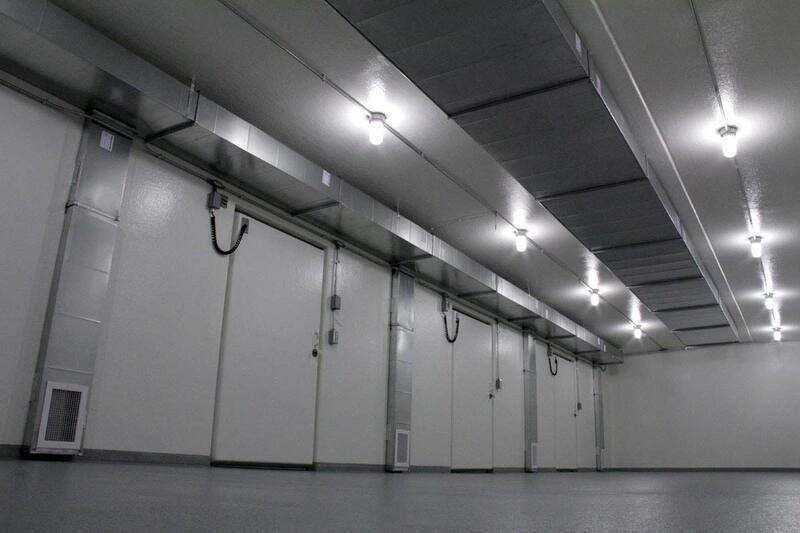 Outdoor walk-in coolers and freezers operate under a high temperature differential (TD), making resistance to heat and moisture critical factors to consider when choosing an outdoor walk-in. The materials and design used to build the walk-in will dictate the unit’s ability to offer long-term reliable operation. Polar King’s fiberglass exterior design absorbs very little heat because of its natural properties against conductivity. Conventional metal and steel exteriors are actually conductors, thus absorbing and storing much of the heat. This requires the refrigeration system to work overtime; causing maintenance issues, increased electricity consumption and ultimately reducing its longevity. 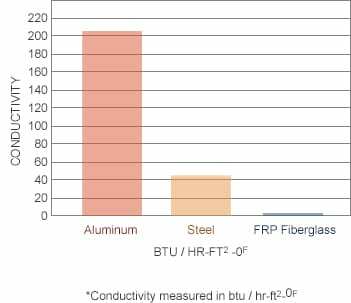 In a comparative analysis, Polar King proves to be far superior to Aluminum and Steel at only 0.04 BTUs. Polar King provides the unique ability to manufacture highly customized refrigeration solutions beyond the typical foodservice application. Our highly customized walk-ins can be designed with minimal limitations; much like the construction of a new building or home. If you can think of it, we can probably do it. 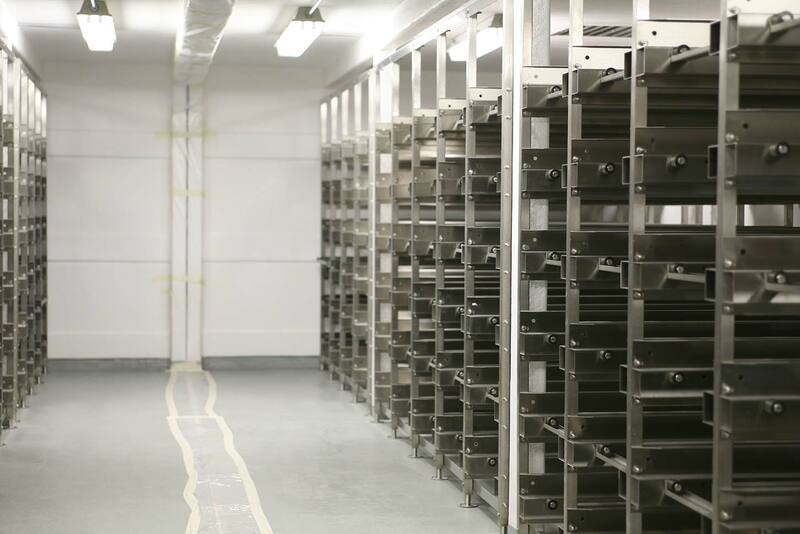 From intricate test chambers to morgues, we’ve designed and built some of the most highly customized refrigeration applications in the world. Polar King’s experienced staff of engineers and refrigeration expert’s work together to design the most practical solution to your specific needs. With over 200 years of combined experience in the field and the very latest technologies in design and manufacturing, you’ve come to the right place for a highly customized application.